Hey Ursa fans! Well, it is July 1st and it is about time I switch things up a bit on my monthly 10% off special. I’ve done army and model deals…now it is time to do something else: COLOUR. This month, any painting order agreed upon in the month of July whose primary colour choice is BLACK will recieve the 10% discount. So, that means Death Company, Ringwraiths, Black Dragons, etc. So…get those “darker” orders rolling in! 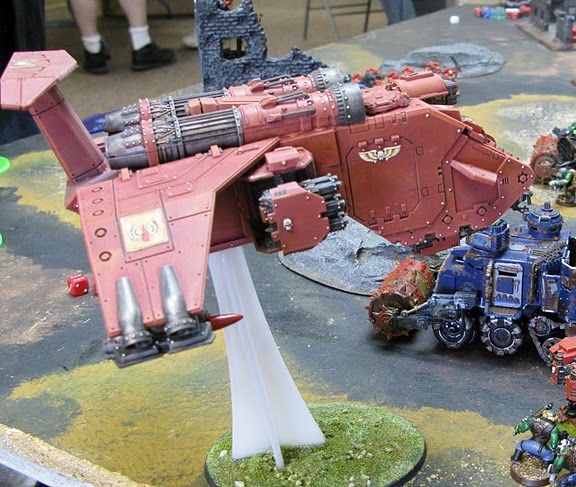 Here is a pic of this last weekend’s 40k Tournament – the debut of the fully magnetized and painted Blood Angel Stormraven! It did very well and looked great on the battlefield! If you want to see more pics of the ‘raven in action, follow the link on the homepage to our facebook, where we have added a few more pics! Hey guys, I’ve got some cool stuff in the works to show you…but they are not quite ready yet, so I’m extending the May Blood Angel special into the whole month of June! Come July, in celebration of convention season being upon us, something big is headed our way!!! Check Out the New Tab! There’s a new section of the website now dedicated to models that I have decided to sell…”For Sale”. It is in its early stages at the moment, but stay tuned. Oh…and tell your friends to stop by the facebook (hit that little button on the home page)…or have them come by the site itself! Thanks! 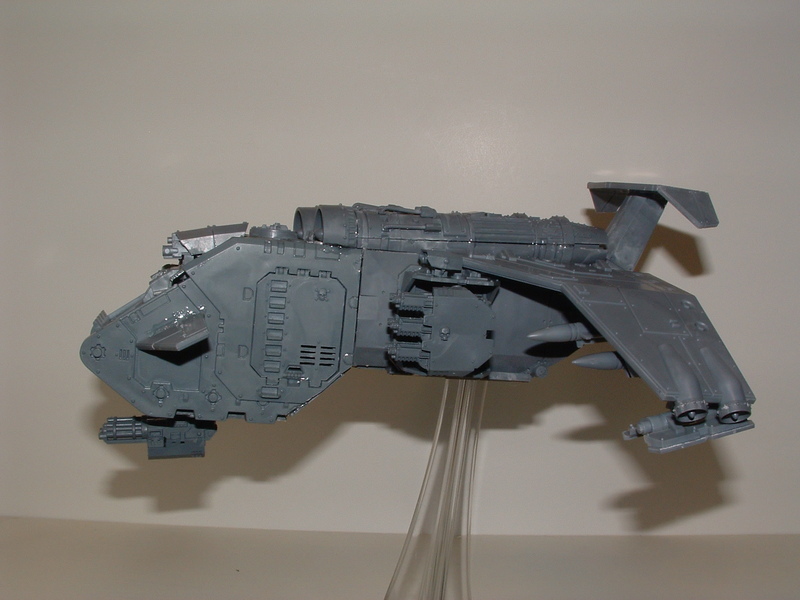 Conversion Job of the Month – Blood Angel Stormraven!!! May Special – The Blood Angels!!! 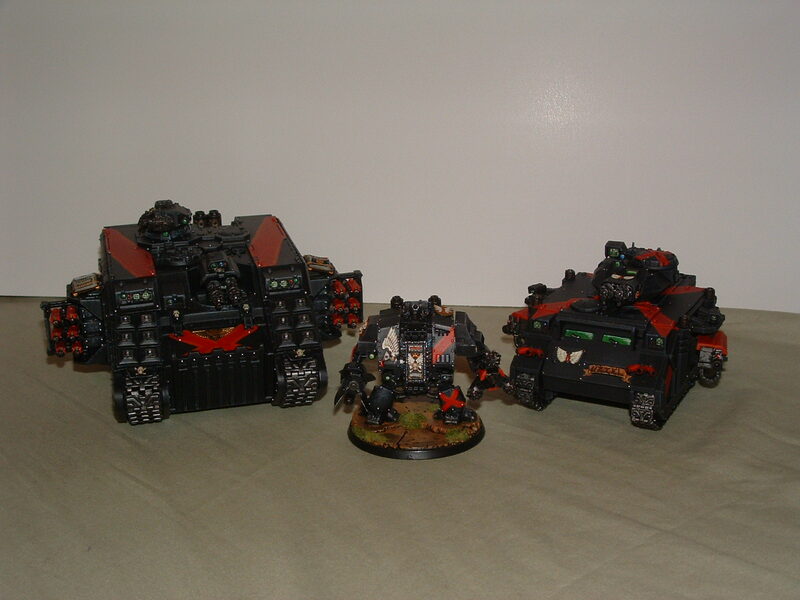 As an avid, long-time Blood Angels player and fan, I am going to celebrate the landing of their new codex with a 10% off special on anything built for or painted for the Blood Angels chapter of the Warhammer 40,000 Space Marines. Stay tuned for a special project I’m working on for my own Blood Angels…something that you as miniature enthusiasts might want me to create for you as well!!! Hey folks! This is the LAST week for the 10% Tyranid special!!! I’m working on some stuff for a client right now, but anything finalized before Saturday still gets the discount. May will bring a new special…and I know it is something that I have LOTS of experience working with! I hope to hear from you soon! Hey all, with April coming to a close at the end of next week, my special on Tyranids ends as well. So, if you want to get an order in for a Tyranid model…now is the time. To celebrate the end of Tyranid Month, I’m scratch-building a couple of Mycetic Spore “drop pods” from the new codex and hope to have pictures up of them in a week or so. If you want a Tyranid built, assembled, converted or painted…make a deal before next Saturday and you can save 10%! I love the new Tyranid codex for Warhammer 40k and some of the new models are amazing…but I do not want to start another 40k army right now. So you get to save money on my desires! Any modelling or painting order that is based on a model in the Tyranid range receives a 10% discount on services rendered! So let’s get the bug orders rolling!